Data have a life cycle as well; according to the Data Sharing for Demographic Research (DSDR) (2005) booklet, Guide to Social Science Data Preparation and Archiving – Best Practice Throughout the Data Life Cycle. 3rd ed. Their diagram illustrates “the key considerations germane to archiving at each step in the data creation process (DSDR 2005: vii).” This was where I first learned about the concept. 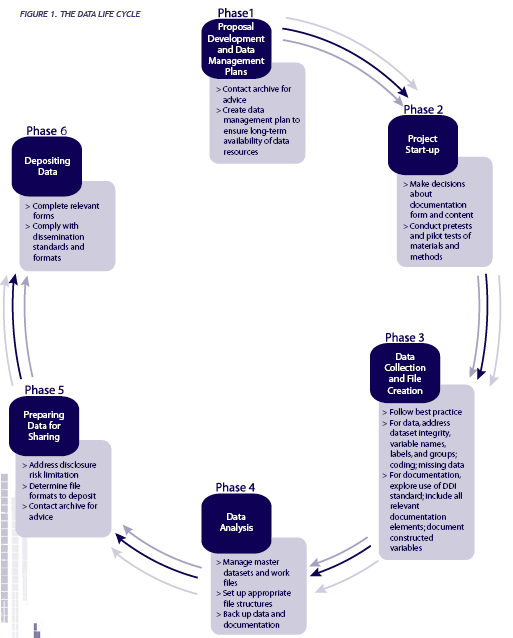 Later on, I encountered an earlier Data Life Cycle diagram from the Consultative Committee for Space Data System’s (CCSDS) publication dated back in 2002 (CCSDS 2002:4-1). It depicts nicely the functional entities and their relationships. Thomas’ (2005) was the first Data Life Cycle diagram I saw that featured any sort of feedback loops. This diagram is from the DDI 3.0 structural reform group report that came out back in 2005. Talking about feedback, Humphrey’s (2006) diagram is not strictly about the Data Life Cycle, but about (empirical) knowledge creation, seen from the “data” angle. Of course, if you are a project that is collecting lots of data, then the data management process repeats itself, forming a natural circle, as in this figure depicting the Survey of Health, Ageing and Retirement in Europe’s (SHARE) database management tasks. 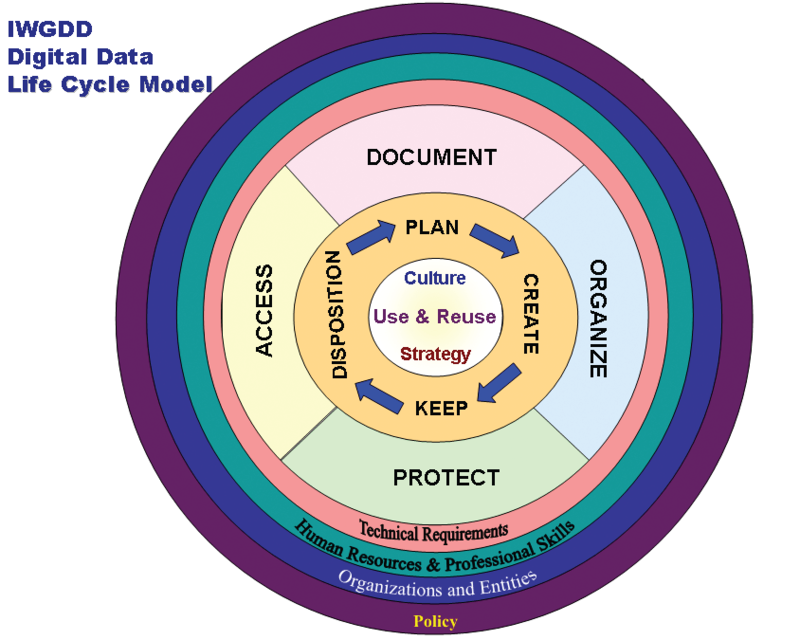 Or, if you have a more abstract viewpoint, then the Data Life Cycle becomes a complicated human endeavor, as the Interagency Working Group on Digital Data (IWGDD) (2009) expresses in this visual model. 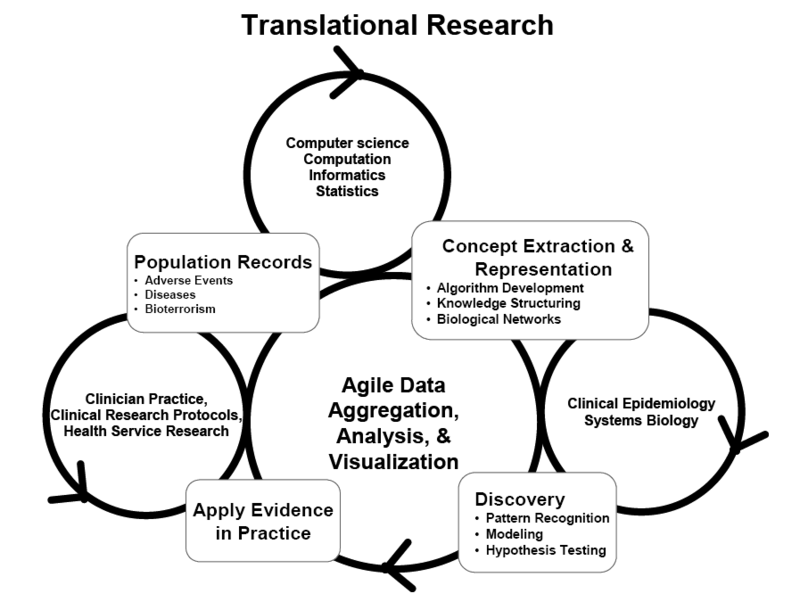 If we focus on a specific setting where data are collected and “consumed,” then one of the appendices of Vanderbilt University Medical Center (VUMC 2005) Informatics Strategic Plan from back in 2005 has an interesting diagram that features four(!) circles. I am not the first one who to collect diagrams. Here is an International Association for Social Science Information Services & Technology (IASSIST) blog entry on the Digital Life Cycle, published in 2006. If you are interested in knowing how researchers actually interact with information, in 2009, the Research Information Network (RIN) and British Library has published a report annex, titled Patterns of Information Use and Exchange. Here is one of the case studies. Arrows in the picture indicate relationships, as in “A may lead to B.” Different colors represent different types of activities adapted from Humphrey (2006) mentioned above. Thus, data are created: Do they live forever? No. Data do die. Michener et al. 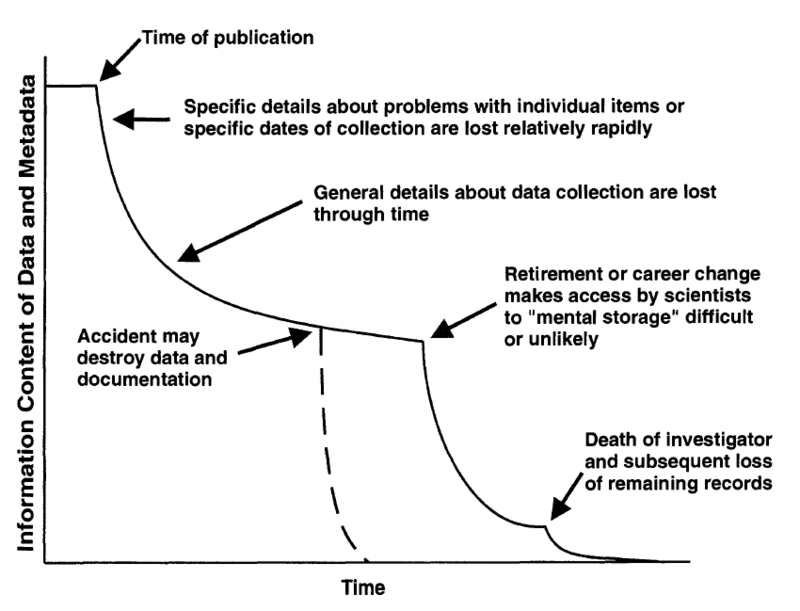 (1997) depicts the process of normal degradation in data and metadata over time. Representing DataONE, Michener (2011) can make the Data Life Cycles come alive either by adding the stakeholder’s needs, or associating each phase with available appropriate tools. The latest Data Life Cycle diagram I came across so far brings us back to the beginning. By the fifth iteration, ICPSR’s (2012) booklet features the Data Life Cycle diagram that is severely bent to form an almost-circle, although it is not quite closed. The then-seven steps are now morphed into the six phases. Consultative Committee for Space Data Systems (CCSDS) (2002) “Recommendation for Space Data System Standards. 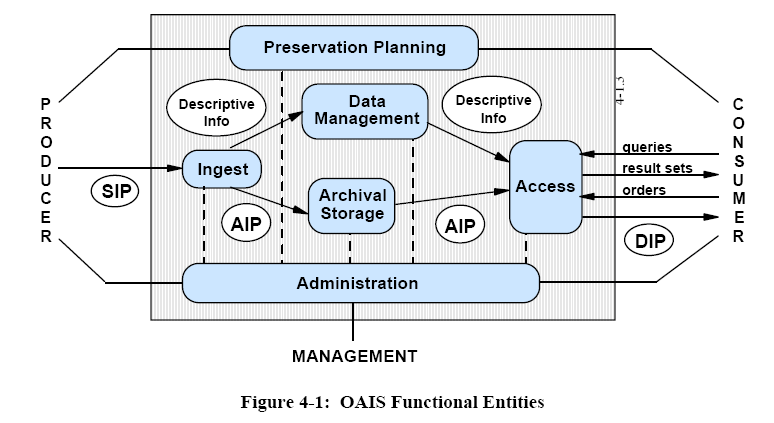 Reference Model for an Open Archival Information System (OAIS)” CCSDS 650.0-B-1 BLUE BOOK. Available here. Accessed on Jan 9, 2012. Data Sharing for Demographic Research (DSDR) (2005) Guide to Social Science Data Preparation and Archiving – Best Practice Throughout the Data Life Cycle. Third Ed. ICPSR. University of Michigan: Ann Arbor, MI. Available here. Accessed on Feb 2012. Humphrey, Charles (2006). “e-Science and the Life Cycle of Research” Document available here. Accessed on Jan 9, 2012. Hunkler, C., T. Kneip, J. Korbmacher, S. Stuck, and S. Zuber. (2011). Glimpsing into the blackbox: Data managing and cleaning processes. In: M. Schröder. Retrospective Data Collection in the Survey of Health, Ageing and Retirement in Europe. SHARELIFE Methodology, Mannheim: MEA. Available here. Accessed on Feb 2012. Interagency Working Group on Digital Data (IWGDD) (2009) “Appendix B. Digital Data Life Cycle.” In Harnessing the Power of Digital Data for Science and Society. Report of the Interagency Working Group on Digital Data to the Committee on Science of the National Science and Technology Council. Available here. Accessed on Jan 9, 2012. Inter-University Consortium for Political and Social Research (ICPSR). (2012). Guide to Social Science Data Preparation and Archiving: Best Practice Throughout the Data Life Cycle (5th ed). Ann Arbor, MI. Available here. Accessed on Mar 9, 2012.
International Association for Social Science Information Services & Technology (IASSIST). (2006). “Conceptualizing the Digital Life Cycle”. A blog entry submitted by Ann. Available here. Accessed on Mat 9, 2012. Merriam-Webster Online Dictionary. (2012) “life cycle”. Available here. Accessed on March 9, 2012. Michener, William, James Brunt, John Helly, Thomas Kirchner, Susan Stafford. (1997). “Nongeospatial Metadata for the Ecological Sciences Ecological Applications, Vol. 7, No. 1, pp. 330-342. Michener, William. 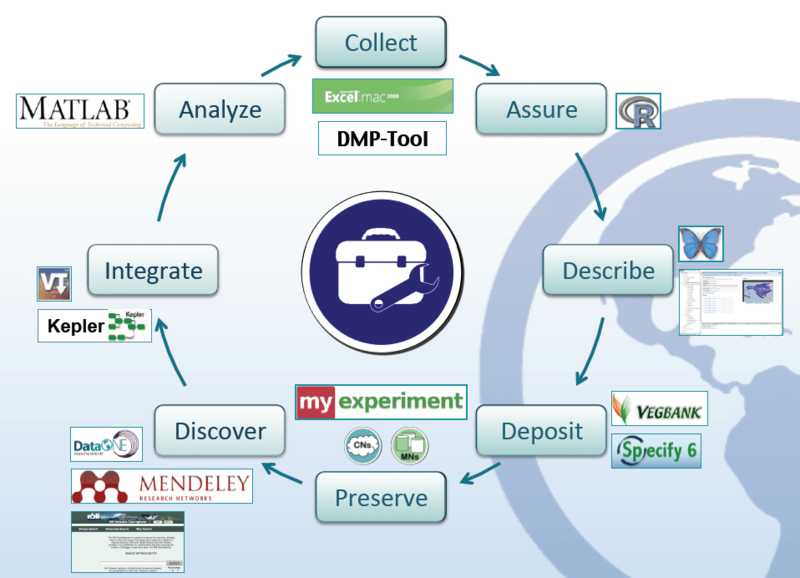 (2011) “DataONE (Observation Network for Earth): Enabling New Science by Supporting the Management of Data Throughout its Life Cycle” A presentation at Workshop on Research Data Lifecycle Management (RDLM 2011). July 18-20, 2011. Princeton University, Princeton, NJ. Thomas, Wendy, Arofan Gregory, Tom Piazza. (2005) “Structural Reform Group Report.” Presentation. Part of a session on “An Inside View of DDI Version 3.0,” Chair Jostein Ryssevik. Available here. Accessed on Jan 9, 2012. Vanderbilt University Medical Center (VUMC). (2005). Strategic Plan for VUMC Informatics & Roadmap to 2010. Available here. Accessed on Mar 9, 2012. 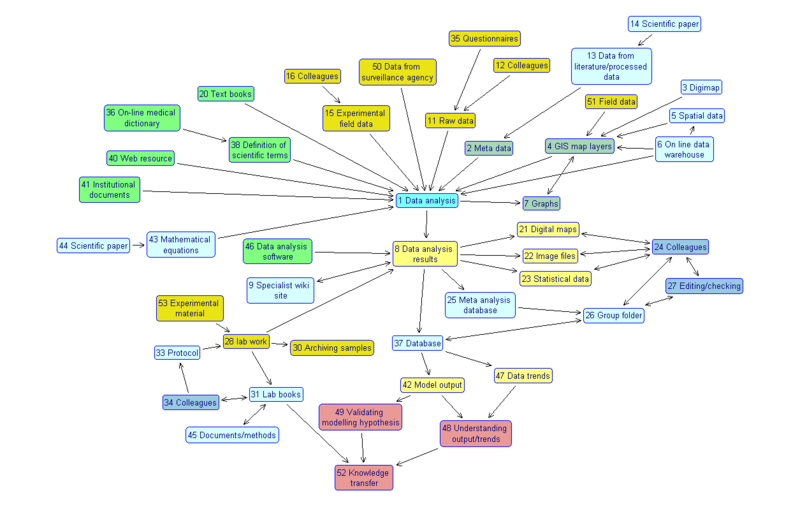 This entry was posted in Data Management and tagged Data Life Cycle, Diagram. Bookmark the permalink.